Veal Marsala, Thyme for Cooking Main Course, an easy Italian specialty. The tender veal scallops cook quickly and are finished with a silky wine sauce. I can't get Marsala so I use Madeira. Both are a slightly sweet, fortified wine. Chicken breasts, pounded thin, or turkey scallops would make good substitutes. Both would need a bit more cooking. Pounding the veal is optional. In a large, nonstick skillet heat the butter and oil over medium high heat. Spread the flour out on a plate. Dip the veal into the flour, coating both sides then place in the pan. Do not crowd. Do them in batches if necessary. Quickly brown on both sides, about one minute each. Remove to a small platter and cover to keep warm or place in a warm oven (250F, 125C). Add the Marsala, beef stock and tomato paste to the pan, stirring constantly and scraping up any browned bits on the bottom of the pan. Let sauce cook rapidly until reduced and thickened slightly, about 5 minutes. Return the veal to the pan, cover and heat through, 2 - 3 minutes. 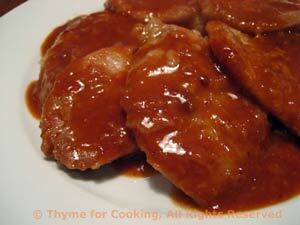 Put veal back on platter, spoon sauce over and serve.